Terra Madre Nordic is a gathering and celebration of the Nordic Slow Food network of small-scale, high-quality producers, activists, academics, civil society, and cooks. My colleagues from the Nordic Food Policy Lab and I will be out and about during the weekend – meeting familiar and new faces, tasting the best of the Nordics and spawning new plans from all the inspiring talks and discussions. 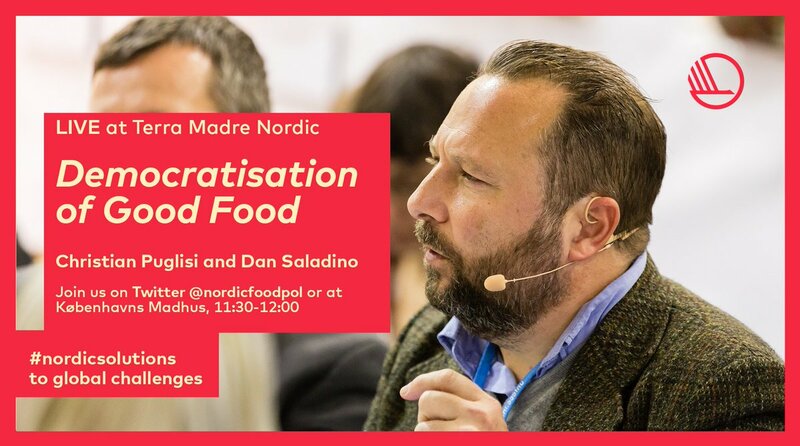 We’ve staged a live interview on the topic of market-based biodiversity and the democratisation of food good between chef and restauranteur, Christian Puglisi, and BBC Food Programme producer and journalist, Dan Saladino. Make sure to check it out! It will be happening at Københavns Madhus from 11:30-12:00 on the April 28th. I will be moderating the panel discussion, Towards a Common Nordic Food Policy at Copenhagen House of Food (Købanhavns Madhus) on Saturday, April 28th, 2018 (12:00-13:30). We will be diving into the issue of whether co-operation can make us all better in the end. I have also signed myself up for a workshop on Icelandic skyr! (Did you know that it a cheese and not a yoghurt?). There are so many other interesting workshops to check out – something for everyone, really! On the evening of the 28th, a good friend, Tommaso Sarti, will be running Terra Madre Nordic’s Disco Soup. The idea is simple: food leftovers will be collected from farmers, supermarket, restaurants and bakeries. Everything will be brought into the TMN kitchens and washed, peeled, sliced and cooked with the help of a few volunteers and chefs. Once the soup is ready it will be served for free in the Københavns Madhus yard and, of course, good music won’t be missing! Another good friend, Viola Capriola, will also be running the Slow Food Youth Zone. On Sunday, April 29th, Caro and Petra from GRIM will be talking about how we can make high-quality ingredients more available to more people. For more information on the programme, click here! The event is supported by the Nordic Council of Ministers.